​Time To Visit Minnie's Flower Shop! Minnie Mouse has opened her very own flower shop, and your child is invited to visit and help her with her busy day! Walk Minnie through the front door and start watering the flowers with Minnie's watering can. Then place the flowers into the wheelbarrow so she can wheel them inside. Wow – they're growing already! Put the flowers on display in the front window and watch as they grow and blossom in the sun. Next, Minnie rides up to the second floor on her spinning petals elevator that grows like a flower as it rises to the top. There's plenty of work to do upstairs as well, as Minnie displays the flowers in the upstairs window for everybody to see. Minnie also sells balloons at her flower shop, and when your child flips the balloons, who shows up to help out but Minnie's best friend, Daisy Duck! When she's done with her busy day, Minnie rides back down on the elevator and relaxes with a ride on her fun swing. There sure is a lot to do at Minnie's Blossom Bow-tique! ​Plenty Of Fun Things To Do! 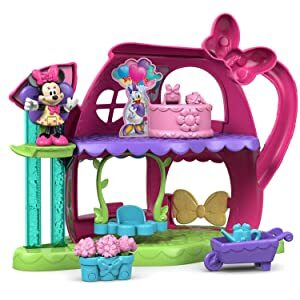 Minnie Mouse's Blossom Bow-tique is a plastic 2-level 2-sided playset shaped like a watering can that comes with various accessories and play features. When your child places the flower box into the windows or the wheelbarrow they magically grow. Place Minnie in her elevator and as your child raises it up and down the flower blossom spins. There is a flip-out balloon display with Daisy Duck on the other side. There is also a swing where your child can place Minnie. 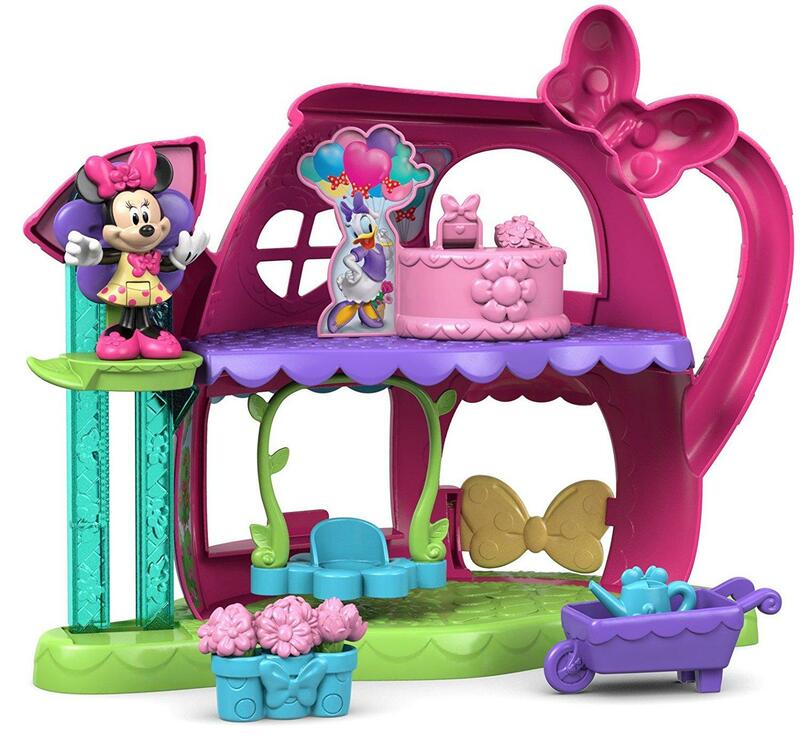 Minnie's Blossom Bow-tique playset comes with a 3-inch (7.62cm) plastic poseable Minnie character figure, flower box, wheelbarrow, and watering can – everything your child needs for a fun day selling flowers with Minnie!